As a Casio artist, I must say this is definitely Christmas in July. I am looking forward to getting a chance to explore what these new boards, (particularly the PX-560M) can do! NASHVILLE, Tenn., July 8, 2015 /PRNewswire/ — Today, Casio America, Inc. is thrilled to announce the addition of two new models to its well-known Privia digital piano line – the Privia PX-360M and PX-560M. 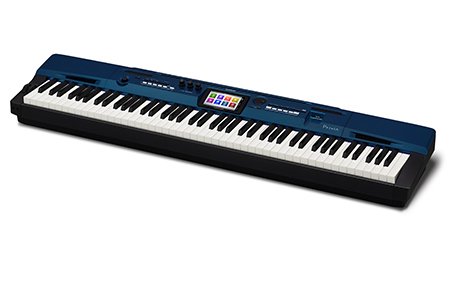 In addition to the standard features and Casio’s proprietary AiR technology, these new models offer advanced and professional musicians a refreshed design, the addition of line outputs and new rhythms and tones. The Privia PX-360M and PX-560M will be on display in Casio’s booth (#432) at Summer NAMM 2015, July 9-11, 2015 at the Music City Center in Nashville, TN. Casio’s Privia PX-360M and PX-560M feature a 5.3″ Color Touch Interface™. This graphic color LCD display makes accessing the built-in tones, rhythms and other features easy for players of any experience level. Featuring Casio’s AiR Sound Source and an 88 note Tri-sensor Scaled Hammer Action keyboard for a superior grand piano sound and feel. Both models have a sleek, compact design that makes them extremely portable for those who need a grand piano experience everywhere they go. The PX-360M boasts 550 built-in tones and includes 200 rhythms with full accompaniment. Using the Color Touch Interface™ users can easily layer tones and quickly split the keyboard. These combinations along with a rhythm selection can easily be stored and recalled as Registration for performances. This ensemble digital piano features 1/4″ audio outputs and inputs, USB and standard MIDI ports, USB drive audio recording and playback and can be used with the optional CS-67 stand and SP-33 three pedal board. For the musician that needs more, the PX-560M’s impressive features include 256-note polyphony, 600 preset tones, 400 user tones and 20 programmable insert effects. Utilizing Hex-Layers, the PX-560’s sound palette can provide sonic landscapes and capabilities derived from Casio’s award winning PX-5S Stage Piano. The PX-560M also offers additional controller features with pitch and modulation wheels, three knobs for real-time control, footswitch and an expression pedal input. Casio’s new Privia PX-360M (MSRP: $1199.99) and PX-560M (MSRP: $1599.99) will be available later this summer at select music dealers nationwide. To learn more about Casio’s line of Privia digital pianos and full portfolio of electronic musical instruments, please visit www.CasioMusicGear.com.